In October 1956 Tom Whittaker, the club’s manager, died of a heart attack. He had won the league twice and the FA cup as manager of the club, and served Arsenal with great honour over the years as player, assistant manager and finally manager. His league championship in 1952/3 was the last trophy of the club until 1971 – and indeed the only near misses were the two league cup final defeats under Bertie Mee in 1968 and 1969. Jack Crayston took over from Tom Whittaker mid season and stayed for a second season before moving on, and he was replaced by George Swindin – who like both Whittaker and Crayston was an ex-player of the club. George Hedley Swindin, between 1936 and 1954, made 297 apparences for Arsenal as a goalkeeper, including two seasons when he appeared 42 times for the first team. George was born in Doncaster and played for Rottherham YMCA, New Stubbin Colliery, Rotherham United, Bradford City (his first professional appointment), Arsenal and Peterborough United. He played 26 games for Bradford City, before being transferred for £4,000, making his début on September 3, 1936, in a team that include Male, Hapgood, Crayston, Copping, Hulme, Drake and Bastin. He was one of three players used in that season in goal, and was said to be erratic at first. Despite the club again using three keepers the following year under the management of George Allison, we won the league and George Swindin got his league winners’ medal. In the war, in common with many players, he became a physical training instructor, and continued to play in wartime matches. In the second season after the war Arsenal won the league with Swindin in goal for every game, keeping clean sheets in 21 out of 42 games. After 1950 he was again sharing the number 1 shirt, but played in two cup finals in 1950 and 1952, winning the first. He finally came under the challenge of Jack Kelsey but played enough in 1952/3 to get his third championship medal – the final triumph of the Whittaker era. Swindin moved to Midland League side Peterborough United as player-manager in 1954, and took his team to several famous FA Cup runs and three consecutive Midland League titles between 1956 and 1958. When George Swindin became manager in 1958 it is said in most histories that he made huge changes to Jack Crayston’s side that had come 12th in the previous season. But this is not quite true. For 1958/9 the opening XI on the first day of the season were all players who were there the year before. Newcomers did arrive or were promoted from the reserves, but in this first season only Docherty (38 games) and Henderson (21 games) made a significant number of starts. But Arsenal were top of the league in February 1959 , however they slipped away despite the return of top scorer David Herd after a period of injury at the end of 1958 (not the other way around as Arsenal’s own web site has it). After this the chopping and changing did start, and by the end of the year seven players had made their first start for Arsenal, but of these probably only the name of John Barnwell will be familiar to many supporters, 60 years later. Eventually the club reached third place, but that was the high point and after that the darkness set in. George’s record was not too after that. 13th in 1960 (and knocked out of the cup by Rotherham), 11th in 1961, 10th in 1962 – there seemed to be no progress. What is noticeable is that the number of players who played 25 or more league games a year (out of 42) declined year by year under Swindin, and yet in the 10 years from 1952 to 1962 the best years were the years with the most players playing over 25 games. Consistency was always a winner at this time. By his final year as manager all the players he had inherited apart from Jack Kelsey had gone and the regular players we were left with were McCullough, Eastham, Bowen and McLeod – the four who with Jack Kelsey made over 35 appearances in the final season. Worse, this was Tottenham’s era – of which we may perhaps say no more just here. After resigning as manager in May 1962 he went to Norwich for five months, and then Cardiff from 1962 to 1964, resigning after the club were relegated to the second division. After that he moved to my local clubs – Kettering Town and Corby Town, and then left football. (Actually I would love to know more about his work with these two clubs – anyone who knows please do write in). The, George owned a garage in Corby (again I wish I could find it – I live just outside the town, and no one seems to remember) before retiring to Spain. He returned to England later but suffered from Alzheimer’s. He died in Kettering (I imagine at the hospital – the hospital in fact where my three daughters were born) in October 2005, aged 90. A couple of things I’d like to add. He won First Division titles 15 years apart. I don’t know of any other player that managed this. He didn’t resign. He was told in March 1962 that he was going to be replaced by Billy Wright in the summer. He was quoted in the Daily Mirror along the lines of “it’s not the done thing”. Although, to give him his dues, he stayed until the end of the season. Thanks for another interesting blog. No need to apologise for the personal bits, they serve to broaden out the outside world timeline. With the rise of N17 it wasn’t easy being an Arsenal kid in East London. My memory of George goes back to 1940/41 when he guested for Oldham Athletic. Against all odds, he kept a clean sheet so well that after the match both sides clapped him off the field. I have cut the end of this comment because it calls for physical harm to befall people at AFC. 1959 with my dad. 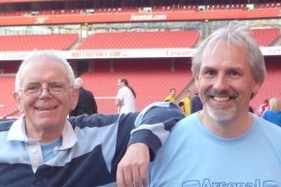 We were north bank regulars, my dad had been going since the 40’s. I remember those years of darkness very well and such “greats” like Alan Skirton and in my opinion the worst player ever to wear that great shirt, Eddie Clamp. However bad they were however they were still the Arsenal.Now, I honestly don’t know what they’ve become but they’re not THE ARSENAL.